over the weekend we were craving chinese food. instead of going out to eat or ordering take out, we made homemade vegetable fried rice right at home. we had a ton of fresh veggies that we had just picked up at the grocery store, so we threw all sorts of yummy veggies into this dish including red pepper, yellow pepper, scallions, carrots, celery, broccoli, mushrooms, and zucchini. the scrambled eggs and soy sauce give this dish that distinct fried rice quality, and the sesame oil and toasted sesame seeds give it a great flavor! 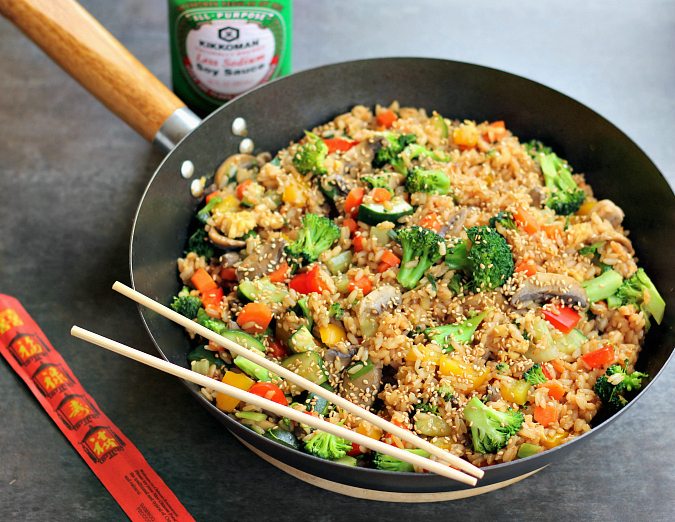 this recipe is a great base recipe because you can add anything into the fried rice that you want in order to make it your own. 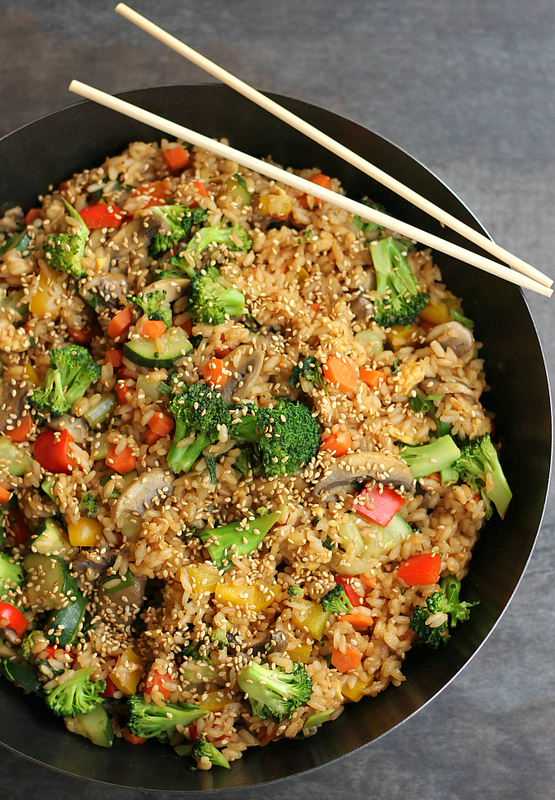 this dish is so easy to make that you won't need to order fried rice take out again! it makes enough for leftovers all week long too! in a sauce pan bring the water to a boil. add the rice, reduce the heat, and simmer covered for 20 minutes until the rice has absorbed all of the water. fluff with a fork. meanwhile, heat a wok over medium heat and add the sesame oil. add the diced vegetables and saute until tender (about 10-15 minutes). 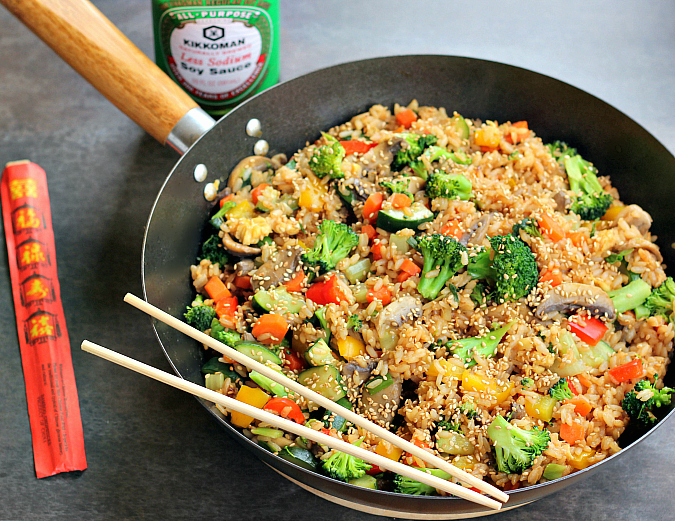 once the vegetables are cooked, remove them from the wok and set them aside in a large bowl. melt the butter in the empty wok. scramble the egg in the butter. add the cooked rice to the wok and pour the soy sauce over the rice. toss to evenly coat the rice, adding more soy sauce if needed. cook for 5 minutes. add the vegetables to the rice. 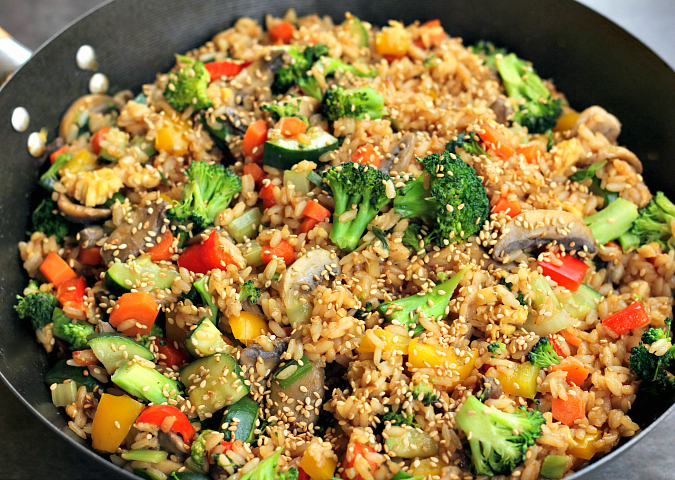 toss to evenly incorporate the vegetables into the rice. top with toasted sesame seeds. serve warm. I just went to Shoprite today to get the ingredients for fried rice. I must have been reading the blog in my mind. Or the aroma wafted down from your house.